For as long as I can remember, I have loved making from scratch birthday cakes. 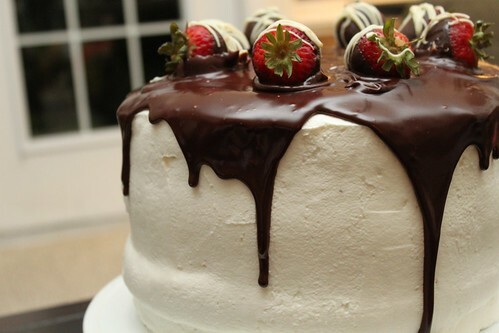 One of the first ones that comes to mind is a chocolate hazelnut birthday cake for my brother’s (and my) birthday. Unfortunately, I somehow measured the wrong amount of hazelnuts in that cake, and it pretty much ruined Nutella for me for at least 5 years (don’t worry, I’ve now come to my senses). There were other times in college, where cooking in a small dorm kitchen that literally had no cooking utensils seemed like a great idea. There was freshman year, where I figured I had nothing better to do than to make a 3 layer meringue cake with whipped cream and fruit. There were several $50 german chocolate cakes, since they required buying not only the ingredients, but also pans, bowls and something to stir with. There were multiple coffee cheesecakes that served as birthday cakes, pies that served as birthday cakes and then of course the most recent Malted Chocolate and Marshmallow Six Layer Cake. So last year, when John’s only wish for his birthday cake was boxed chocolate cake mix with simple whipped cream as the frosting, I was slightly appalled. I made the cake, I even ate a piece, and I was glad he liked it, but seriously – how boring! 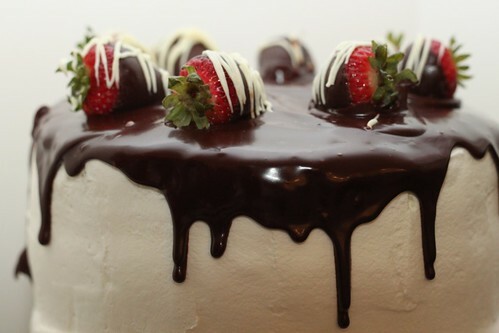 As his birthday approached this year, I was almost afraid to ask what kind of cake he might like, because I knew that no matter what I suggested, he would come back with the same chocolate cake with whipped cream. 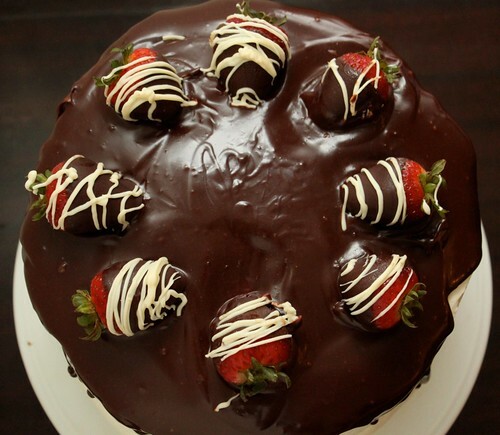 Then this cake popped into my mind, or rather popped up on my google reader. I had seen it earlier on Annie’s blog, but it was way back in January when I wasn’t thinking about October birthdays. I immediately knew that this would be the perfect birthday cake for John because it’s basically a dressed up of version of his favorite. The flavors are still simple, but the ganache adds just that oomph it needed to make it not only more delicious but also quite stunning. The strawberries are obviously optional, but they certainly add to the presentation. I sized down the original recipe because everyone mentioned how it was such a tall cake, and I felt a little guilty putting 4 cups of sugar in a cake (but of course, in my head, 3 was fine). I thought it came out perfectly with a slightly downsized recipe, and so that is the version I have included below. This cake is definitely a keeper and I’m really glad I was able to find something that both I enjoyed making and John enjoyed eating. Happy Birthday baby! I still love you no matter what kind of birthday cake you want :-)! To make the cake layers, preheat the oven to 350˚ F. Line three 9-inch round cake pans with parchment paper. Butter and flour the inside edges of the pan, shaking out the excess flour. To make the frosting, add the heavy cream to the bowl of an electric mixer fitted with a whisk attachment. Whip on medium-high speed until soft peaks form. Add the powdered sugar and continue to whip until thoroughly combined and stiff peaks form. Be careful not to over-beat! This entry was posted on October 22, 2011 by Spice Is Nice. It was filed under Cake, Dessert . I also remember when we (mostly you) made Susan Branch’s multiple layer coconut cake for Linda’s birthday one summer!